Today, we're excited to share our new look! This complete overhaul of our technology architecture is the largest desktop redesign since LinkedIn’s inception, and we’ve taken a thoughtful approach to ensure we’re delivering a simplified LinkedIn experience that's more intuitive, faster and creates more value for our members. With this change, we’re also providing a seamless experience across mobile and desktop, leveraging all the great feedback we’ve received from our recent mobile app launch to make it even easier for professionals to quickly access the most relevant professional conversations, content and opportunities. More intuitive: we’ve dramatically simplified the design and navigation, so that there's one consistent experience across mobile and desktop. The new design is also built on a single-page application, which enables a snappy, cohesive, application-like experience. Unlike a traditional web application, you can expect smooth and seamless transitions as you engage with the site, since it doesn’t require full page reloads. Faster innovation: our new technology stack shares the same front-end API’s as the LinkedIn mobile app and allows the release of new code three times a day. This means we can innovate much faster across platforms. More valuable: we’ve made it much easier to discover relevant professional news and insights, quickly join professional conversations about your industry, and access new job opportunities. Streamlined navigation: There are now seven core areas on the navigation bar — Home (Your Feed), Messaging, Jobs, Notifications, Me, My Network, and Search. With one simple click on the “more” icon on the navigation bar you can also launch into other experiences that matter to you, like LinkedIn Learning. Better suggestions to make your profile stand out: We’ve improved profile suggestions so you can more easily see what you need to do to look your best professionally, for example, suggested skills you should add to your profile based on what recruiters are searching for. 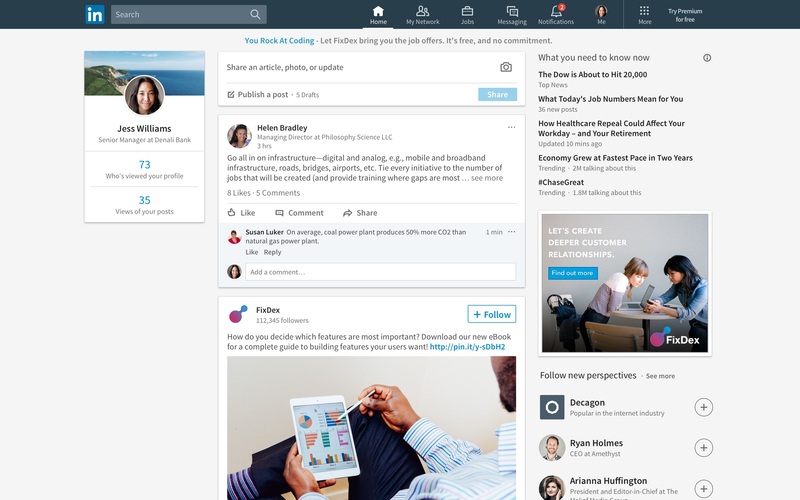 The new LinkedIn desktop experience will be rolling out globally to all members over the coming weeks.